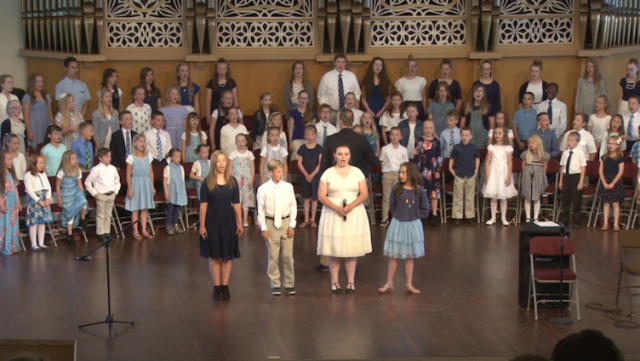 “I Know Heavenly Father Loves Me” is the first music video by the Rexburg Children Choir. This children’s choir in Southeastern Idaho is only a few months old and includes children from ages 6-18. The setting of this music video illustrates the message of this favorite LDS Primary song by showing the beauty of the earth. Choir director Ben Watson recently moved to Rexburg to teach at BYU-Idaho. “I moved here in January and I was looking for a choir for my kids. I couldn’t find one so I thought I would start one,” he explained. When he announced the choir would be starting, he expected that a few dozen children might show up. But at the first rehearsal, he had over 100 children.